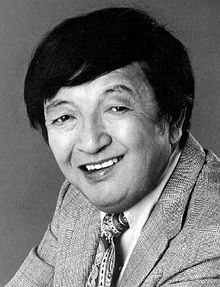 Jack Soo (October 28, 1917 – January 11, 1979) was a Japanese American actor. He was best known for his role as Detective Nick Yemana on the television sitcom Barney Miller. Soo was born Goro Suzuki on a ship traveling from Japan to the United States in 1917. He lived in Oakland, California, until ordered into internment along with other Japanese Americans during World War II. He was sent to the Topaz War Relocation Center in Utah and fellow internees recalled him as a "camp favorite", an entertainer singing at dances and numerous events. Soo's career as an entertainer began in earnest at the end of the war, first as a stand-up nightclub performer primarily in the Midwestern United States. He changed his name to Soo after working at a Chinese night club. During his years playing the nightclub circuit, he met and became friends with future Barney Miller producer Danny Arnold, who was also a performer at the time. Jack Soo and Nancy Kwan in Flower Drum Song. Soo finally earned his big break in 1958 when he was cast in the Broadway musical hit Flower Drum Song in the role of the show M.C. and comedian Frankie Wing ("Gliding through my memoree"). He was working in San Francisco at the Forbidden City, a Chinese nightclub and cabaret, which was portrayed in the musical and movie. He was offered the chance to go to Broadway on the condition that he change his name to something Chinese, as Flower Drum Song is set in San Francisco's Chinatown. At that time, he adopted the surname that he had used to leave the internment camp at Topaz, "Soo". Soo switched to the Sammy Fong role (Chinatown's "Nathan Detroit") during the run and played the role when the film version (1961) of the musical was made. Soo was first broadcast across America by Jack Benny on November 27, 1962, as the tough-talking, street-wise talent agent in "Jack Meets Japanese Agent". In 1964, Soo played a weekly supporting role as Rocky Sin, a poker-playing con artist in Valentine's Day, a comedy television series starring Anthony Franciosa that lasted for one season. During the next decade, he would appear in films such The Green Berets as a colonel of the Army of the Republic of Vietnam and the 1967 musical Thoroughly Modern Millie, as well as making guest appearances on TV shows such as Hawaii Five-O, The Odd Couple, and two episodes of M*A*S*H.
Soo joined Motown Records in 1965 as one of their first non-African American artists. During his time there, he recorded a slow ballad version of "For Once in My Life" as the first male singer to do so. The record was never released and was shelved in the Motown archives. The song was soon after made famous by Stevie Wonder. Soo was cast in his most memorable role in 1975 on the ABC sitcom Barney Miller as the laid-back, but very wry, Detective Nick Yemana, who was responsible for making the dreadful coffee that, in one of the series' running jokes, his fellow detectives had to drink every day. Occasionally, his character played against stereotypes of Asian-Americans by emphasizing Yemana's solidly American background. Soo refused to play roles that were demeaning to Asian Americans and often spoke out against negative ethnic portrayals. Soo was married to Jan Zdelar, a model. The couple had three children and two grandchildren. Jack Soo (far right) with the Barney Miller cast. Soo was diagnosed with esophageal cancer during Barney Miller's fifth season (1978–79). The cancer spread quickly, and Soo died on January 11, 1979, at age 61, at the University of California at Los Angeles Medical Center (now the Ronald Reagan UCLA Medical Center). His last appearance on the show was in the episode entitled "The Vandal," which aired on November 9, 1978. On the show there was a running joke that Soo's character made bad coffee. Therefore, his last known words were when he was being wheeled into an operating room and he joked to Hal Linden, referring to his cancer - 'it must have been the coffee'. A retrospective episode showing clips of Soo aired at the end of the season, which concluded with the cast members raising their coffee cups in a final farewell toast to him. ^ "Jack Soo". nndb.com. Retrieved September 19, 2015. ^ a b Adachi, Jeff (2009). "The Jack Soo Story". You Don’t Know Jack: The Jack Soo Story. Retrieved April 5, 2016. ^ "Yahoo TV". yahoo.com. Retrieved 19 Sep 2015. ^ C. Y. Lee, author of The Flower Drum Song, in the special features of the Flower Drum Song DVD, Universal Pictures, 2006. ^ "'The Jack Benny Program' Jack Meets Japanese Agent (TV Episode 1962)". imdb.com. Retrieved September 19, 2015. ^ "Year of Snake? Ah So! Orientals Mark Season's TV". Desert Sun. UPI. 7 January 1965. Retrieved 20 September 2018. ^ Lom, Michael (November 2, 2011). "'More Stories from Jeff Adachi' on Asian Pacific Arts". asiapacificarts.usc.edu. Retrieved May 24, 2011. ^ "PBS: You Don't Know Jack Soo". pbs.org. Public Broadcasting Service. Archived from the original on July 2, 2013. Retrieved April 5, 2016 – via web.archive.org. ^ "Jack Soo, 63, Actor in 'Barney Miller'. He Was Sgt. Yemana in Television Series Appeared in Movies". The New York Times. United Press International. p. 19. Retrieved July 10, 2018. ^ "CTVA US Comedy – "Busting Loose" (Paramount/CBS)(1977) Adam Arkin". ctva.biz. Retrieved September 19, 2015. This page is based on the Wikipedia article Jack Soo; it is used under the Creative Commons Attribution-ShareAlike 3.0 Unported License (CC-BY-SA). You may redistribute it, verbatim or modified, providing that you comply with the terms of the CC-BY-SA.